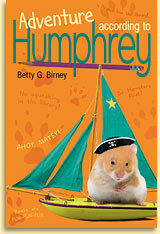 Humphrey's life has always been full of adventure, but when his friends build their own model boats and prepare for a sailing competition on Potter's Pond, he feels left out. He has plenty to keep him busy, though. At night, he watches videos in his newly-discovered favorite place, the library. During the day he lends a helping paw to mend the growing problems between Kirk and Richie, and Gail and her mother. But he has pirates on his mind. First, there's the unsqueakably exciting pirate book Mrs. Brisbane reads to the class. Then Aldo begins to act - and talk - like a real live pirate! Is there treasure hidden somewhere? And how can he stop one student from ruining the race with a terribly misguided plan? In the end, Humphrey gets more thrills and chills than he ever dreamed of ... but can he survive his most fur-raising adventure yet? Be ye prepared for a treasure chest full of surprises, mateys. Ye'll be very, very surprised indeed!